Join New Urban Arts and other leading arts organizations for the 2018 Senator Pell Lecture! This year’s Pell keynote address will be given by Nina Sanchez (Enrich Chicago) and will be followed by a panel discussion with leaders in the Rhode Island art community including, Howie Sneider (The Steel Yard/Valley Arts District), Daniel Schliefer (New Urban Arts/PYAC) and Elena Patiño (RISCA/NALAC/Expansion Arts) and moderated by Valerie Tutson (RIBS). Established in 2009, the Pell Lecture seeds critical conversations that build from Senator Pell’s vision for our nation, inviting Providence to come together to celebrate and share its communal histories of art, culture, and creativity. 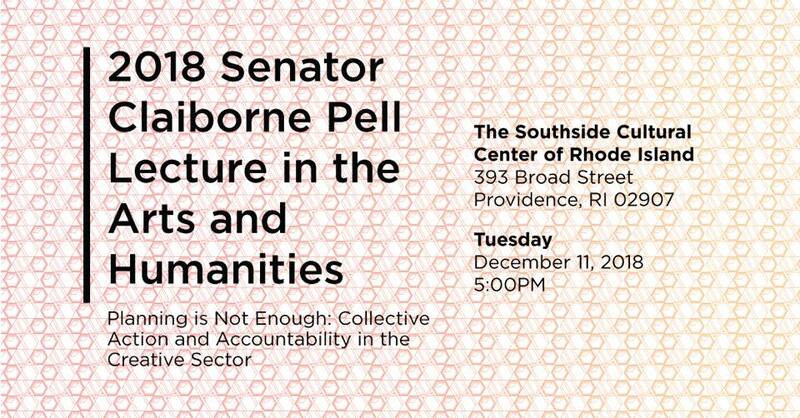 The City of Providence and its partners host the annual Senator Claiborne Pell Lecture on Arts and Humanities to honor the late Claiborne Pell (1918-2009), who represented the State of Rhode Island in the United States Senate from 1961-1997. Senator Pell was a lead sponsor of the “Basic Educational Opportunity Grants” program in 1973, renamed Pell Grants in 1980; they have been critical mechanisms for providing financial aid to college students in the United States. He also played a pivotal role in the founding of the National Endowments for the Arts and Humanities.